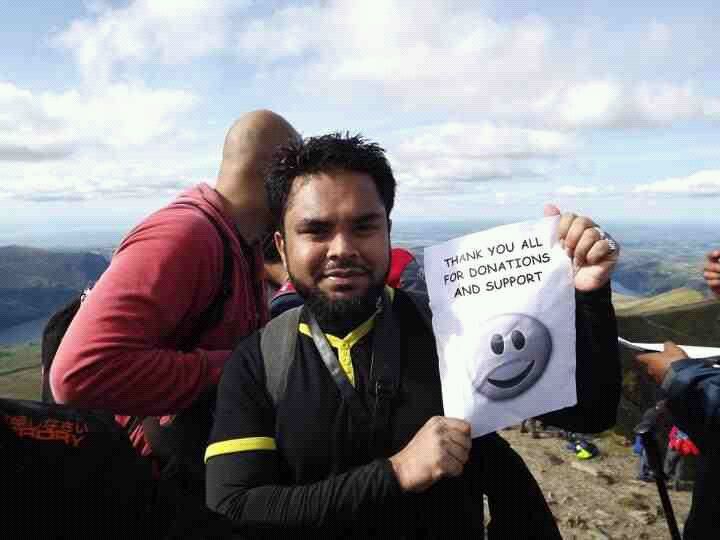 Alhamdu Lillah on Saturday 22 September 2012 I went with Islamic Relief on our trek to Mount Snowdon in Wales. We left London just before 5am and after two pit stops, one for Fajr and the other for breakfast, we reached Mount Snowdon just before 11am. We started the climb immediately upon our arrival, as we arrived later than our scheduled start time. We reached the summit (top of the mountain) around 2:30pm and finished the climb back down around 6:30pm. It was physically one of the toughest things I have ever done. I must admit I did very little exercise before hand, so that didn’t help, but Alhamdu Lillah none the less as I am glad I made it to the top and back. For anyone else considering doing a mountain treks, make sure you take regular exercise before hand and also work your leg muscles as they can start giving in once you start getting higher and the mountain gets steeper. A couple of our legs did give in and we had to take the journey back down really slow with plenty of stops. Anyway the reason for this post is to say a big Jazak Allahu Khair and Thank You to everyone that sponsored me. I have so far raised £407 for Islamic Relief’s Water4Life campaign and as a group we raised over £6000 with donations still coming in. I am going to keep my justgiving page open for a little while longer for anyone else that wishes to contribute. May Allah bless and reward you all.